I’ve seen many productions of A Midsummer Night’s Dream over the years, but I have to say I laughed the most at this one. The Players, Puck, and even Helena were all just a bit more exaggerated in their humour, and it was refreshing. From the colourful circus-inspired fairy costumes to the umbrella motif used throughout the show, this was a unique staging that allowed for plenty of dreaming. The first thing the audience saw coming up over the stairs at the back of the open-ended tent were large black umbrellas as Theseus and Hippolyta discussed their daughter Hermia’s betrothal to Demetrius. The central conflict of the play comes from the fact that Hermia and Lysander are in love and she does not wish to marry the man her father approves of. Demitrius, while also in love with Hermia, has an admirer of his own: Helena begs for his love no matter how hard he tries to dissuade her. The four lovers all gave very strong performances, but Sereana Malani as Helena stood out with her perfectly sassy attitude. Naomi Wright’s Titania was an elegant performance that complemented Ian Butcher’s Oberon very well. Oberon’s scheming Puck played by Kyle Rideout was an audience favourite as he causes all the mischief and confusion between the lovers and even joins the audience, stealing some of their popcorn. My favourite aspect of any production of Dream, and how I tend to rate its success, is The Players. This group of bumbling tradesmen, led by the well meaning Peter Quince (Bernard Cuffling) provided clever comedy as they rehearsed their play, Pyramus and Thisby. Bottom the Weaver (Scott Bellis) was perfect in his donkey mannerisms when transformed, and reminiscent of them when himself. As The Players performed for the duke at the end of the show, they topped off this production with non-stop laughter. Another unique element of this production is the use of pop music interludes. For example, when Puck puts his spell on the lovers, “I Put a Spell On You” blasts from the speakers as he busts a move. This kind of upbeat, tongue-in-cheek humour is what makes this Dream so much fun. 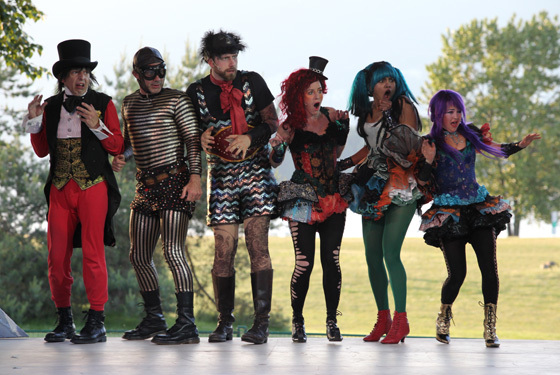 A Midsummer Night’s Dream runs from June 11 to September 20 at Bard on the Beach’s BMO Mainstage in Vanier Park. For more information, visit bardonthebeach.org.